Though seniors may need to work a little harder to maintain their health, there are actually many things to look forward to in the golden years. Life after 65 can be a wonderfully positive experience, and the Harrisburg, PA, respite care experts at Home Care Assistance offer a few reasons why. Some seniors may have difficulty figuring out the latest electronic gadgets as they get older, but they often have the benefit of life experience and intuition to help them through challenging circumstances. The occasional forgetful moment aside, a brain can actually work more efficiently in the senior years. According to researchers at Duke University, the left and right sides of the brain are able to work together better in older adults than in younger people. With age comes the realization that time is too short and valuable to spend on petty grudges and disagreements. This understanding allows seniors to focus on the beauty of the present day and enjoy spending time with loved ones. Even though they may not have as much physical energy as they did when they were young, seniors typically have a better understanding of their priorities, which allows them to channel their energy into the things that really matter. Thanks to modern medical advances, seniors today are remaining healthier and more active than ever before. According to the Max Planck Institute for Demographic Research, a 72-year-old today has the same life expectancy as a 30-year-old from the primitive hunter-gatherer days. The pace of healthcare breakthroughs is likely to increase thanks to collaborations between the healthcare industry, technology companies, and entrepreneurs. 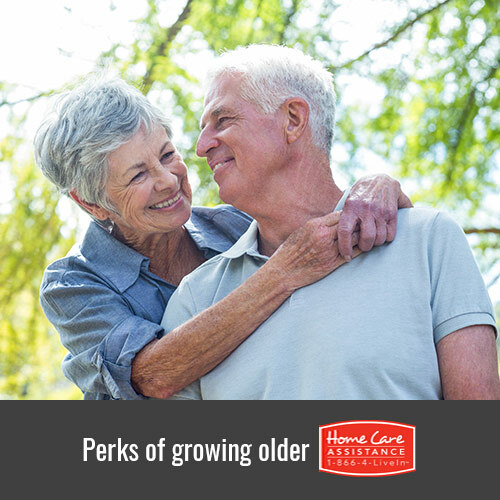 Help your elderly loved one remain healthy so he or she can enjoy the benefits of growing older. If your loved one needs help maintaining a healthy lifestyle, turn to Harrisburg Home Care Assistance. We offer a revolutionary program called the Balanced Care Method, which encourages seniors to maintain strong social ties, keep their minds sharp, and focus on other lifestyle factors that promote longevity. For more information on our high-quality Harrisburg in-home care, call one of our friendly Care Managers at (717) 540-4663 to schedule a complimentary consultation.